Singapore VS Australia – which market is best for business? 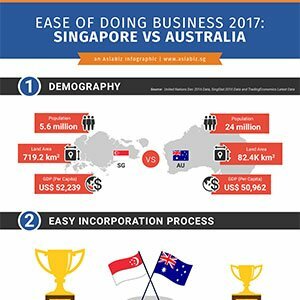 Home » Infographics » Singapore VS Australia – which market is best for your business? Guide your decision-making with the infographic below. We measure indicators ranging from Demography, Company Incorporation Process, Corporate Tax Rate, Internet Speed to IP Protection Laws in both countries. Singapore’s dynamic startup eco-system comprising of its ample government grants and venture capital players as well as high deal volume and value, is also noteworthy. Comparative Business Report: Singapore vs Australia Should you set up your business in Singapore or Indonesia? Ease of Doing Business 2017: Singapore vs India Running a business and deciding between entering Singapore or the United Kingdom?